The Holidays are upon us! If you have gardeners in your life then you know they love to receive gifts related to their favorite hobby. The options are endless but I have picked out 5 top last-minute gifts for gardeners for this 2017 Holiday Season. Here we go! 1. Gift Certificates - for plants from your local independent garden center: If you purchase a gift certificate for your gardener, you will automatically extend the Holidays into next spring. Because every gardener will agree that going to the local nursery to buy plants is a little bit like Christmas Morning. You can't go wrong here and supporting your independent garden center (during December when their revenue is low) is always a good thing to do. 2. Long Tail t-shirts from Duluth Trading Co: Ok, these shirts are awesome because they are a little longer so when you are kneeling or squatting (which you do a lot when gardening) the back doesn't come untucked. Check out their website for more excellent gardening and work clothes. 3. 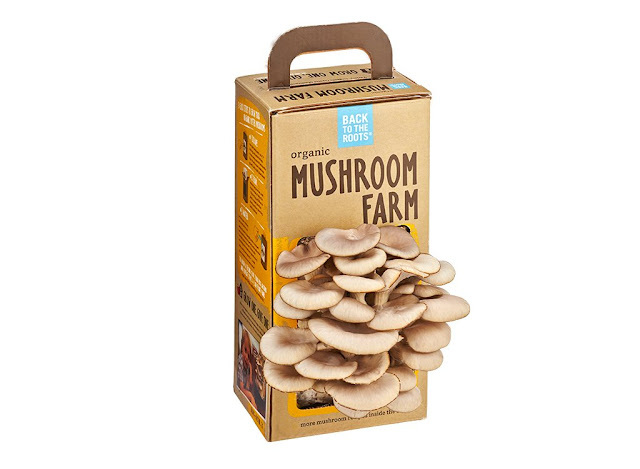 Organic Mushroom Farm from Back to the Roots: This groovy company sells cool things to keep gardeners busy with inside gardening projects like mushroom kits, a water garden and herbs that grow in cans. Here is a big list of gardening catalogues (with links). 5. Gardening Tools! Every gardener loves tools: pruners, loppers, shovels, pitchforks, etc. And if you want to go big, there are power tools: mowers, edgers, hedgers, chainsaws. My favorite power tool for gardening is a sawzall - reciprocating saw. It is designed for demolition - cutting things like wallboard and framing. But I use it for pruning shrubs. It's perfect for small branches that are too big for the loppers. I have been known to get a little carried away with the sawzall and cause some garden "demolition". I think the electric reciprocating saws are better because they have more power so you might want to get a long extension chord to go with it. Gardening tools can be easily found at your local hardware store. gardening tools make great gifts!